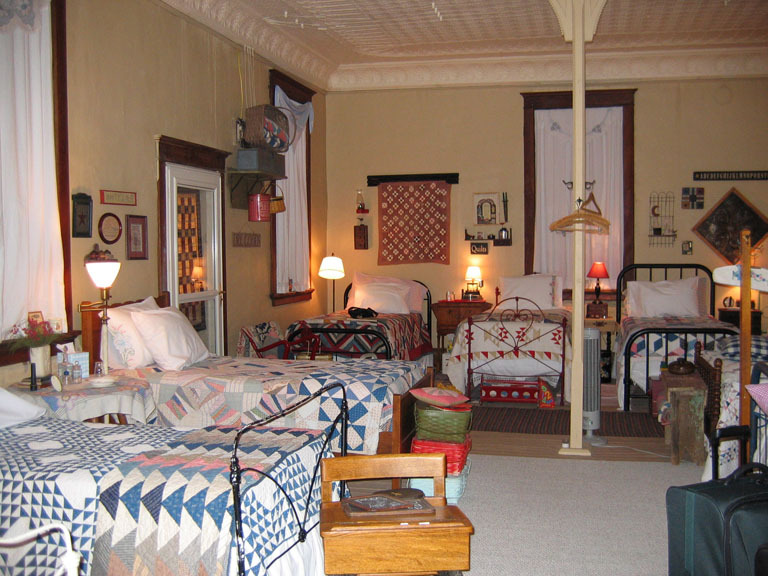 Sue Hageman - OMG, I have been wanting to schedule a retreat at your lovely place. Where is your calendar? Do I need to call? Happy Happy dance! You're the winner of the $40 KT Retreat deposit! 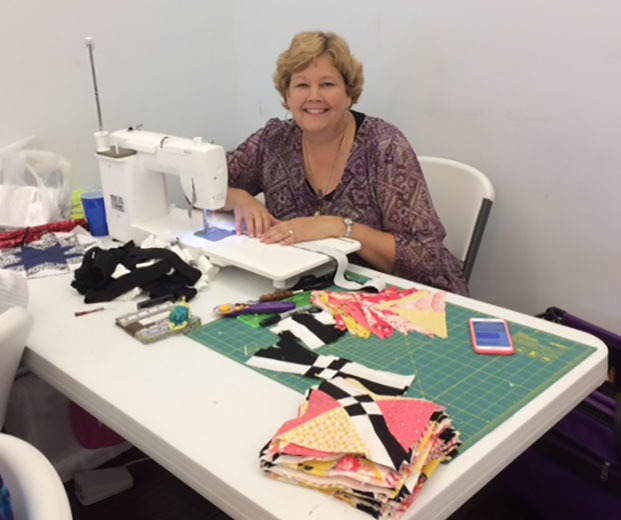 Gather a group of your quilting friends and call Jamie for available dates. Hope to see you next year! Here she is, sewing at lightning speed to prepare blocks for a new tutorial - a Disappearing or Magical Pinwheel of some sort, no doubt. Jenny always has a smile while doing what she loves most - piecing! Jenny and I offered trunk shows and two workshops each over a 4-day retreat with 40 delightful quilters from all over the US and Canada. The positive energy and enthusiasm was so contagious! 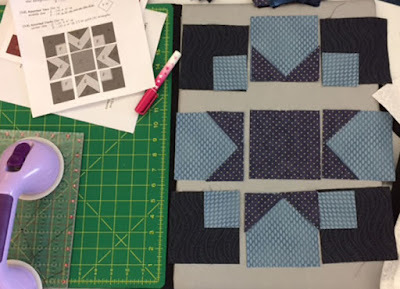 I shared my layered patchwork technique using the 30-Something quilt as an example. Most of the ladies tried a block & loved the simplified piecing. Several made multiple blocks that will result in gorgeous quilts. Here's my version of 30-Something from our KT book Layers of Love. 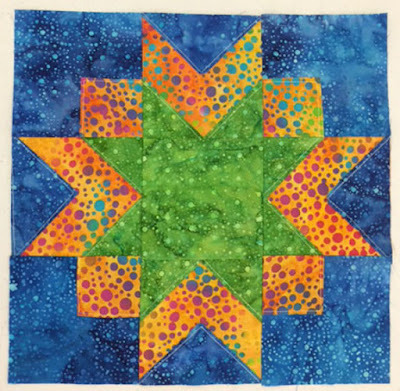 This traditional double star block at its most basic level is a simple 9-patch. 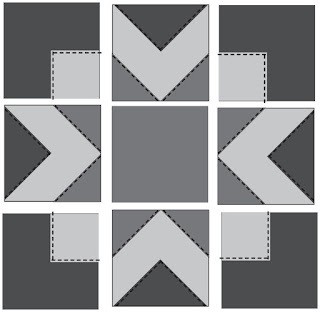 By layering triangles and squares on the backgrounds and topstitching, you've eliminated seams, bulk and pressing errors. Jenny made a block in the time it took for me to do my initial tutorial - less than 30 minutes! 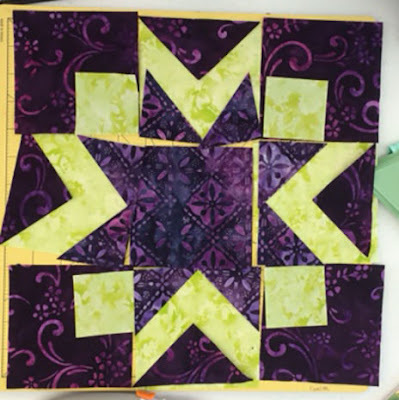 30-Something block using Layered patchwork. KT Prairie Christmas fabric - experimenting with a charm pack. 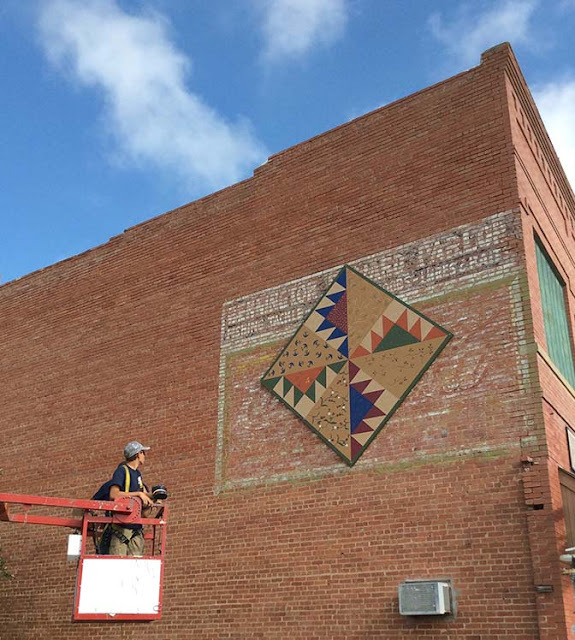 Vibrant batiks make this block sing! A dozen blocks planned in shades of blue take on a mellow note. 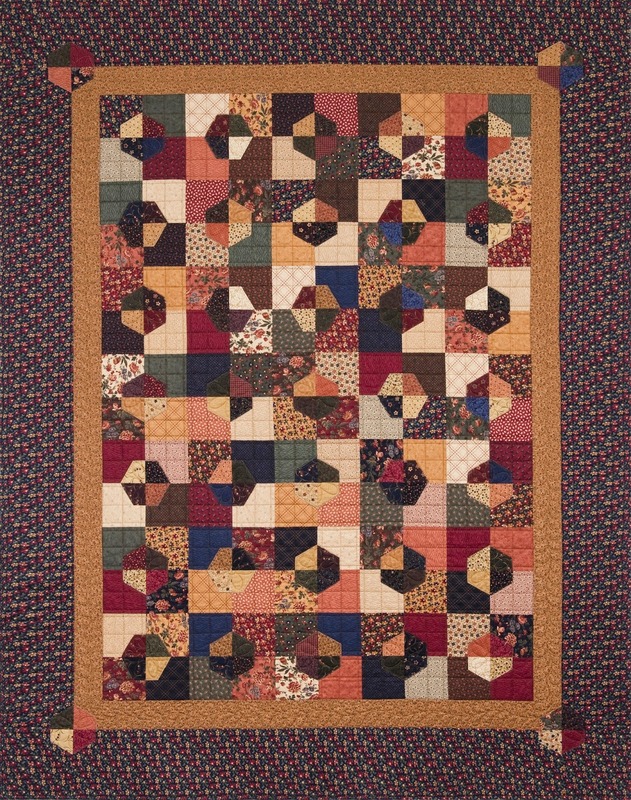 One quilter's purple passion plays out perfectly with layered triangles & squares. 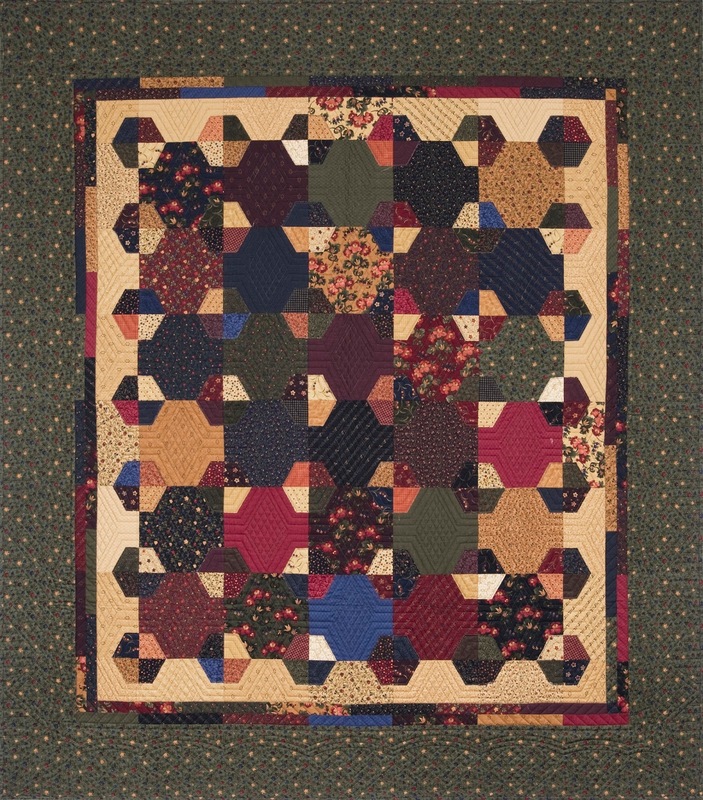 It's so fun to see each quilters' perspective on my designs with the wide variety of color choices. I loved each and every one of them! Thanks to all of you who attended. It was a memorable event for me. I hope to hear from you soon with pictures of your projects. perfect for anyone on your Christmas list. The top row shows how centering a Honeycomb precut on a Layer Cake square, topstitching, cutting into fourths, and sewing four different quarters together, results in a cool, scrappy block with lots of personality & dimension for the Sweet as Honey quilt. 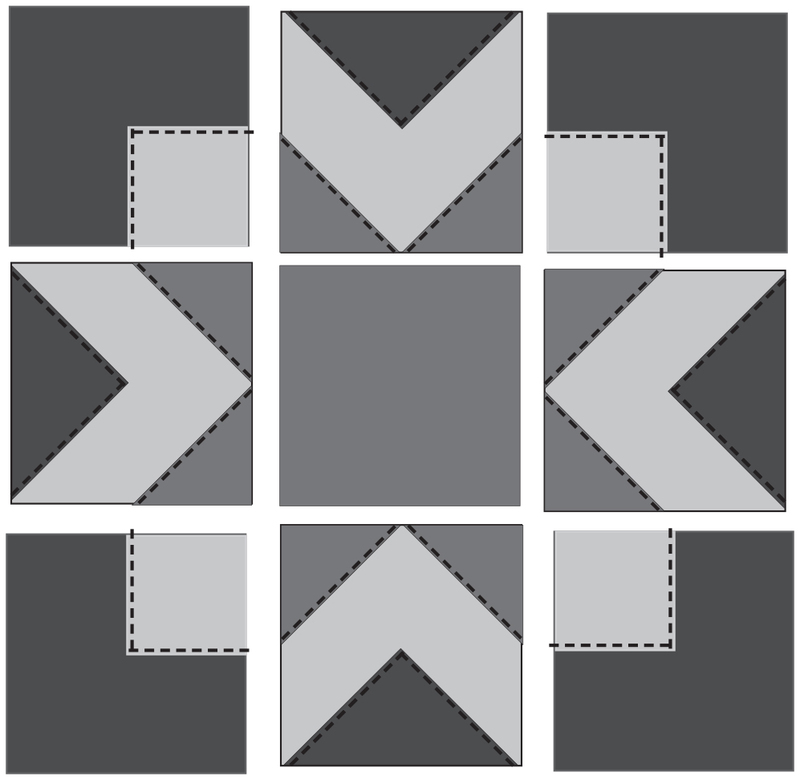 The Bees Knees quilt is even easier, positioning a quarter of a Honeycomb on each corner of a Layer Cake square & topstitching. When you sew layered squares together in rows, the Honeycombs reappear! 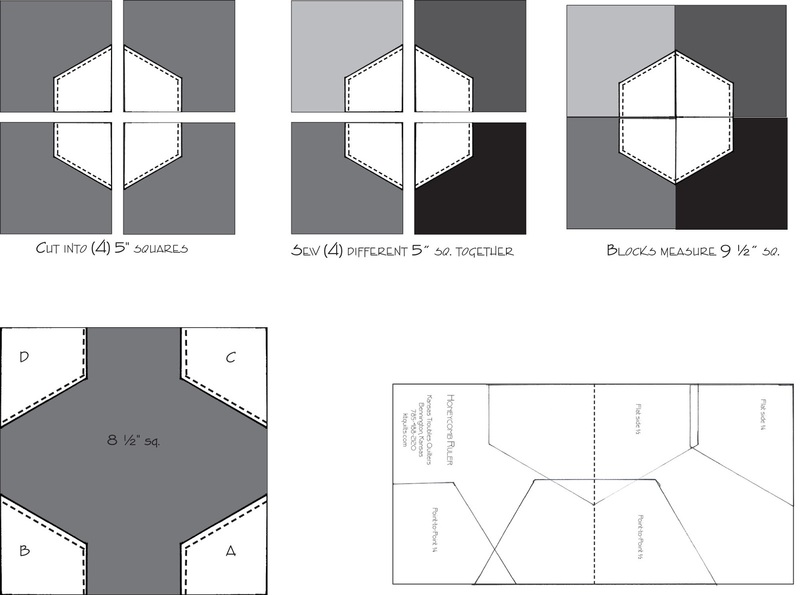 The Honeycomb ruler is show at bottom right with placement lines for either project. If you're interested in the rest of the Sweet As Honey or Bees Knees kits, call Jamie for ordering information 785-488-2120. Comment this week to win the September Special bundle above. Tune in here over the next few weeks to see the new Oak Haven collection.You won't want to miss all the great giveaways! Judy Zoll -As a retired school teacher back to school means something different to me now. I am working hard to finish up some ufos so I can begin some new projects--one that is using KT fabrics! Judy, thanks for all your hard work as a teacher. I hope you enjoy your retirement years, catching up on your quilting wish list. 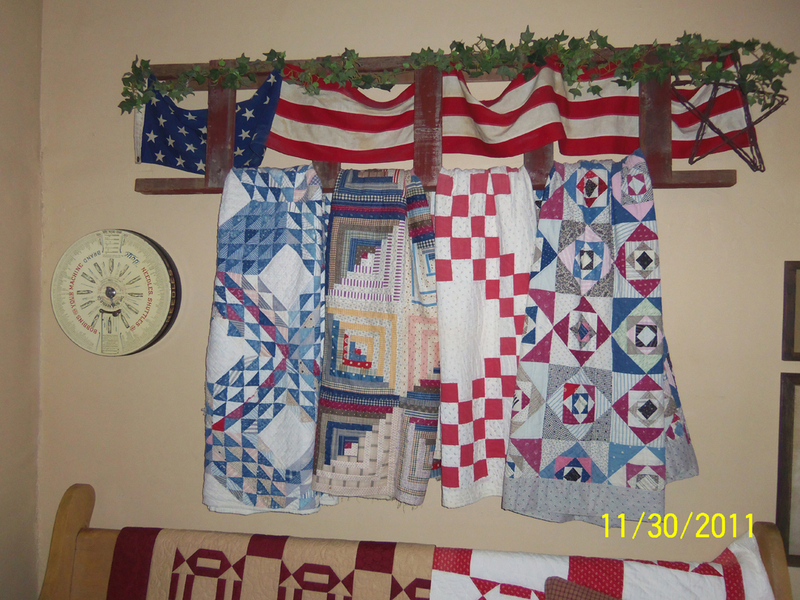 Please send your shipping address to lynne@ktquilts.com and Jamie will bundle up your fat quarters this week. It's the perfect time of year to plan early fall projects with our Sunflower Song fabric. 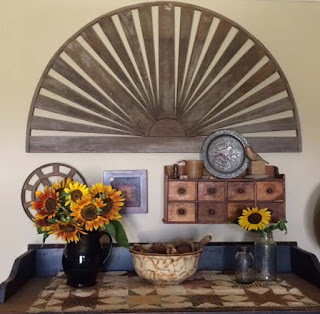 There's just one week left to take advantage of our August Sunflower Song inventory reduction sale. With Oak Haven arriving in September, Robert's trying to make space in the storage room for dozens of bolts of new fabric and precuts. Oak Haven will blend beautifully with Sunflower Song, so it's a great time to add to your autumn stash. Watch August 30th's blog post for a new September KT Special. Standard Retreat: Thursday 1pm thru Saturday 3pm. Our dorm style bedroom is full of vintage quilts and charming decor with blackout shades for sleeping in on lazy mornings. 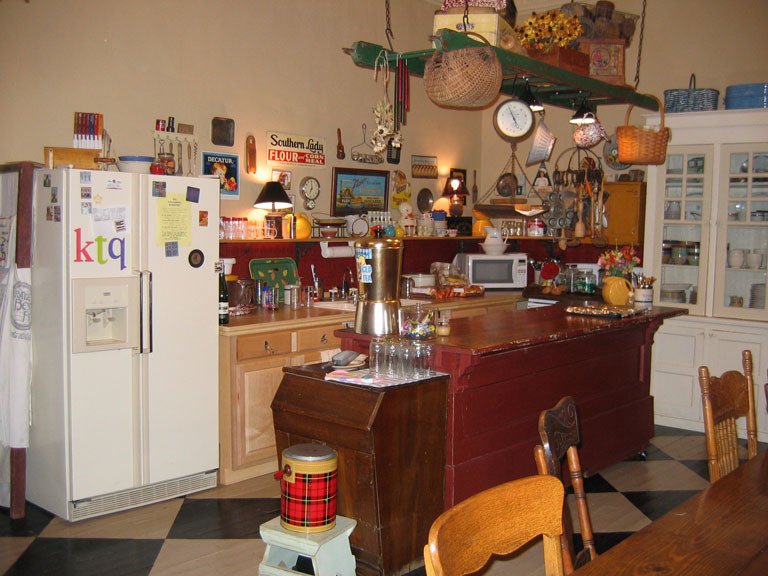 We provide continental breakfast, coffee, tea. 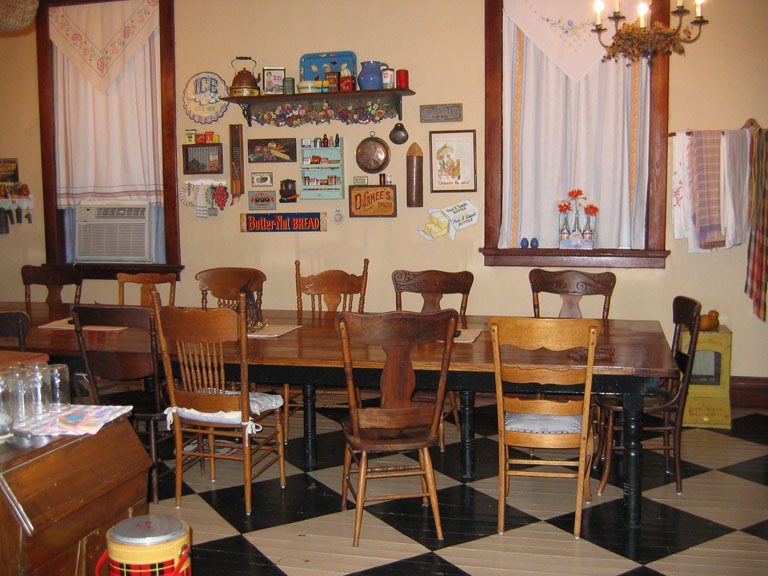 Your group is welcome to bring food to prepare meals or visit the local eateries for deli sandwiches, farmer style dinners or ice cream parlor treats. Our harvest table seats 18. Kitchen is equipped with everything you need to cook for your quilting friends. Fun decor throughout makes our retreat space your home away from home. 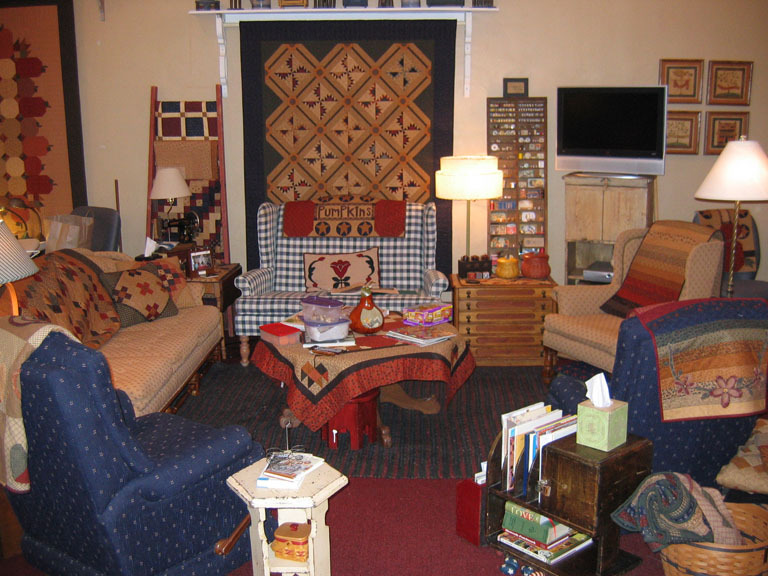 Our gathering space offers comfy seating for hand stitching or TV watching. The sewing area offers a 6-ft table, adjustable computer chairs and lighting for each quilter, plus cutting mats on raised tables and 3 irons/ironing boards for your convenience. 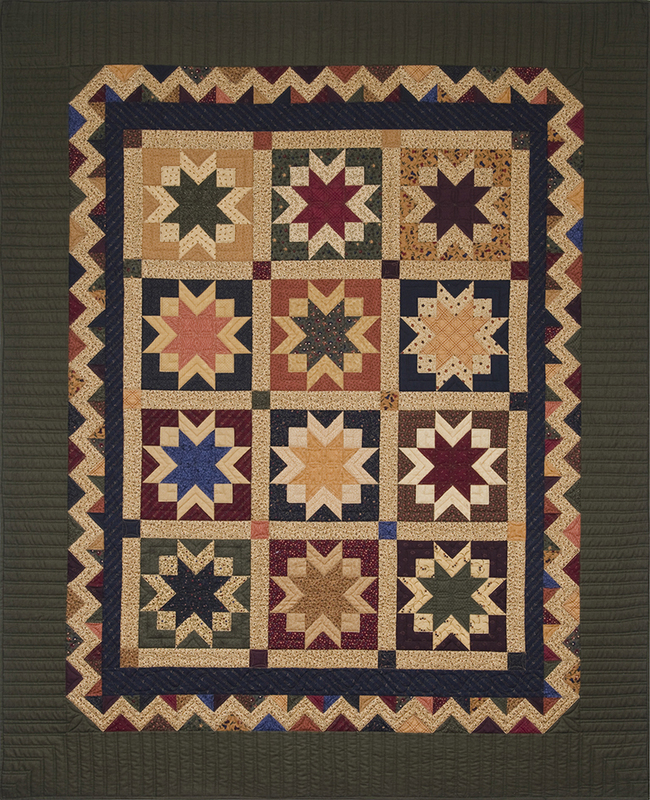 Downstairs, the KT Quilt Shop is open Tues-Saturday for your shopping enjoyment. 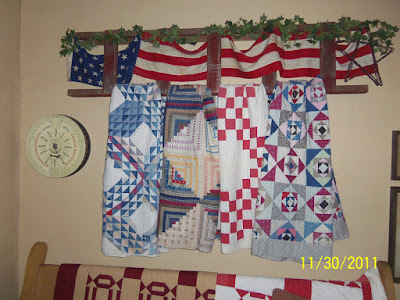 If I'm in town and available, I'll stop in for a tour of the shop and presentation of my layered patchwork technique. Robert and Jamie can help with any of your KT questions. We still have a limited number of openings for 2017. Our 2018 schedule will open later this year. Grab a few friends and make plans to visit us soon! Comment this week to win your $40 deposit for a KT Retreat in 2017 or 2018! 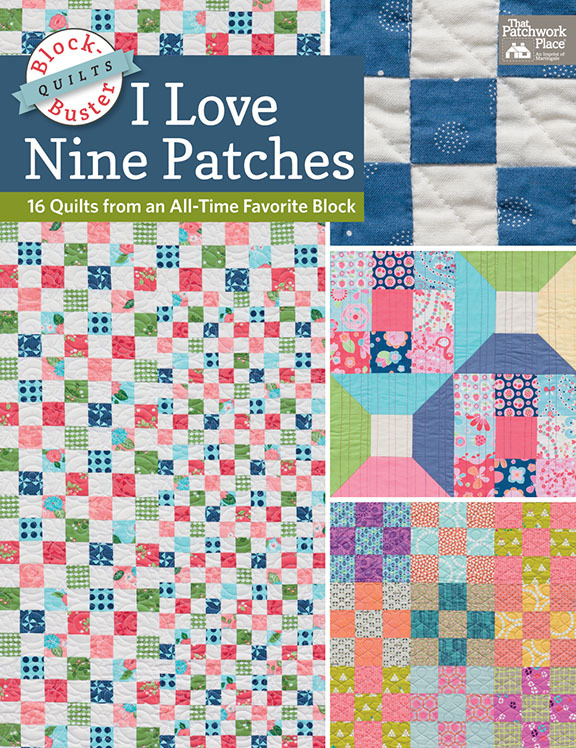 Do you love 9-patch blocks? They're so versatile and interesting and wonderfully easy and complex at the same time. Martingale has done it again with another designer compilation book featuring 18 projects that are all amazingly different using the humble 9-patch block. Check out their blog post to win a book for your quilting library at I Love 9-Patches. 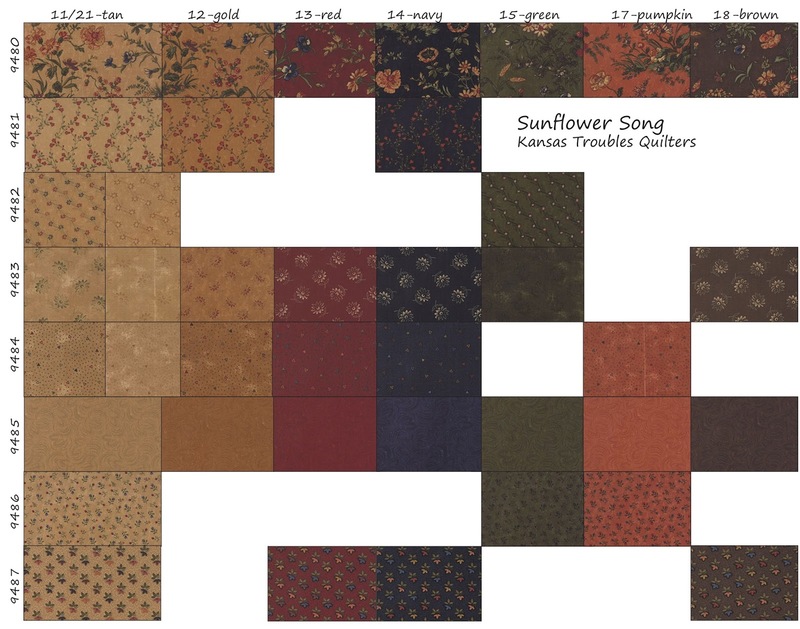 Sunflower Song fabric is on sale and going fast! Make your list and order today while supplies last. 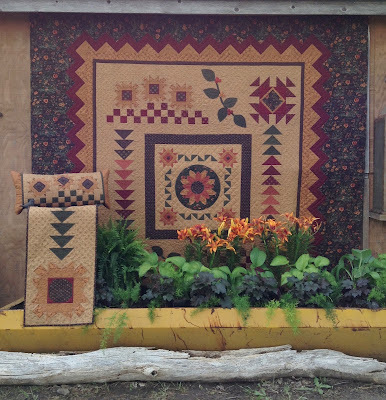 ferne- I love how the barn quilt turned out! 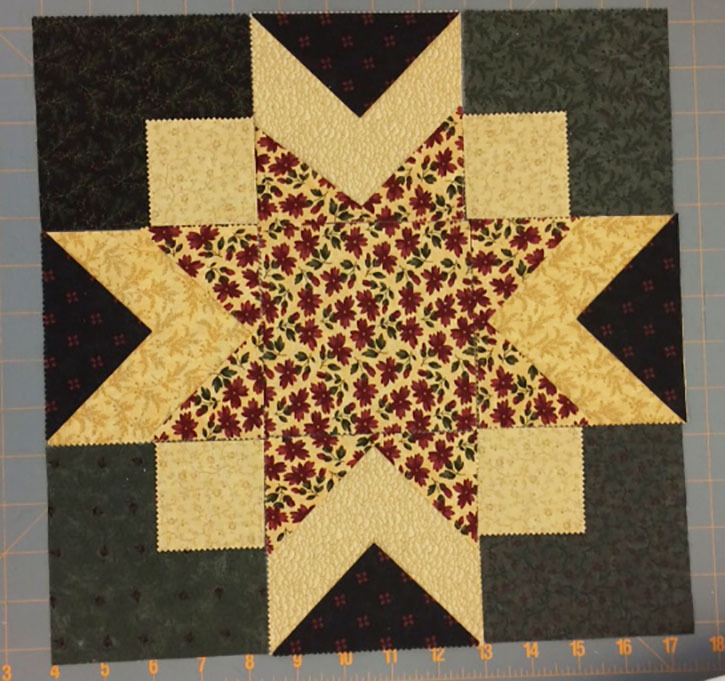 I made a much smaller one for my well house and now I need another for my house...people need to know a quilter lives here! You're the winner of a Sunflower charm and mini charm to start your next bloomin' project! Thanks to everyone who commented. Glad you like the barn quilt as much as I do. It's really quite impressive in person. Hope you can all come visit us sometime. Next week I'll be hanging out with Jenny Doan in Hamilton, MO at the famed Missouri Star Quilt Co. to teach at a retreat. I can't wait to see all the new themed quilt shops that have been finished since I was there last. Jenny and I have to plan "work dates" to see each other since our lives take us in so many different directions. One way we've found to spend time together is to teach on quilting cruises. Our January 2017 cruise is full, but we'll be announcing our 2018 cruise dates soon. To be one of the first to receive information on our upcoming cruises, email our travel agent, Lenore Deck at cruiselady@tampabay.rr.com. I'll post here as soon as we know the ports, etc. Hope you can join us sometime! Here are the lovely ladies from our Jenny/Lynne April 2016 cruise. So many happy ladies! The grankids are back in school, we all bought new crayons in cute tins whether we needed them or not. It's my favorite time of year to shop for school office supplies. When else can you find a Finding Dory zipper bag for sewing notions or an M & M's lunch box for spools of thread? I can't possibly pass up striped pencils or a mini polka dot stapler. My grown kids give me a hard time because I buy as many fun supplies as the grankids. Why not make school and work as fun as we can with cool accessories? Did you know they make motion activated chandeliers for lockers? Yup, checked it off the list! Save 40% now thru August 31st! 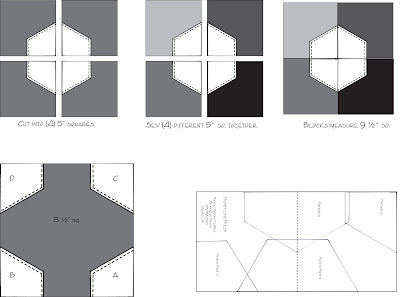 Feel free to print our SKU chart of the entire collection for easy matching at ktquilts.com. I list my fabrics with the UPC number of the print down the left side with the color numbers across the top. It makes more sense to me to have each color in a row. If there's a blank space, you know the print wasn't made in that particular color. Comment this week to win an assortment of (10) Sunflower Song fat quarters. Remember, Sunflower Song patterns and precuts are also on sale thru August 31st while supplies last. 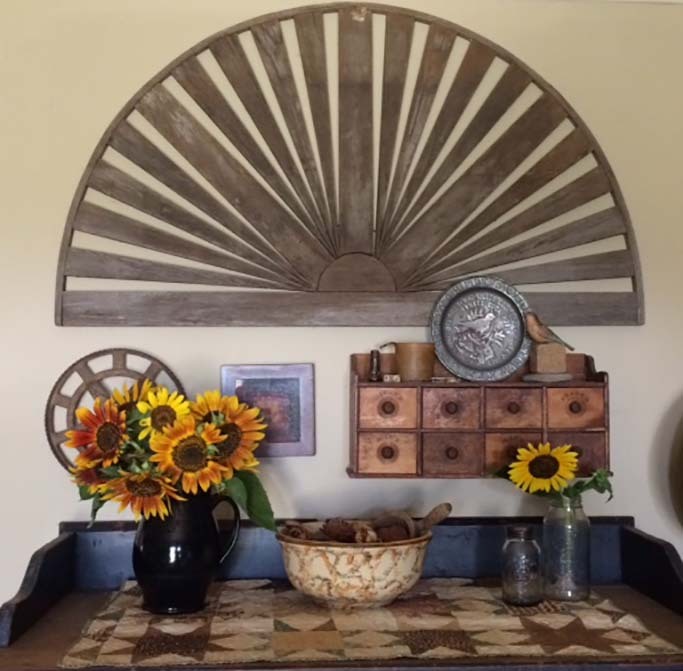 omashee aka Barb - Love, love, love sunflowers & these patterns! Enjoy your Gramma Days, the kids grow up soooo fast! You're this week's winner of our Sunflower Song & Sunny Trio patterns. Thanks for your comments. Enjoy! I was delighted to find this beautiful vase of flowers on my desk at work this morning, courtesy of our KT store manager, Jamie. 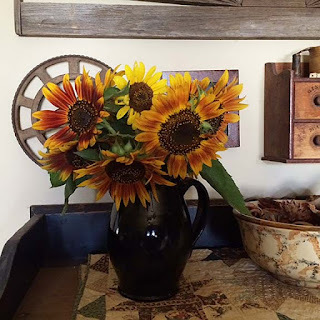 She knows I love sunflowers and gathered these sunny blooms from a friend's field. They totally brightened my day! Thanks again, Jamie! This vase of happiness goes perfectly with our month-long theme of Sunflower Song specials. 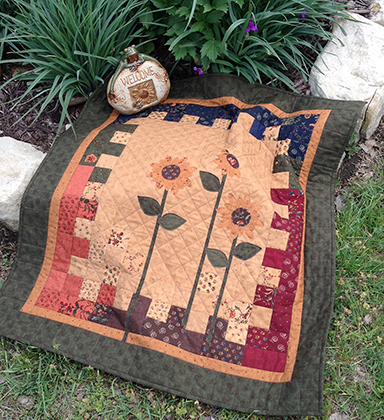 This week, all Sunflower Song precuts are 35% off retail on our website at ktquilts.com. See below for our Sunflower Song giveaway this week. 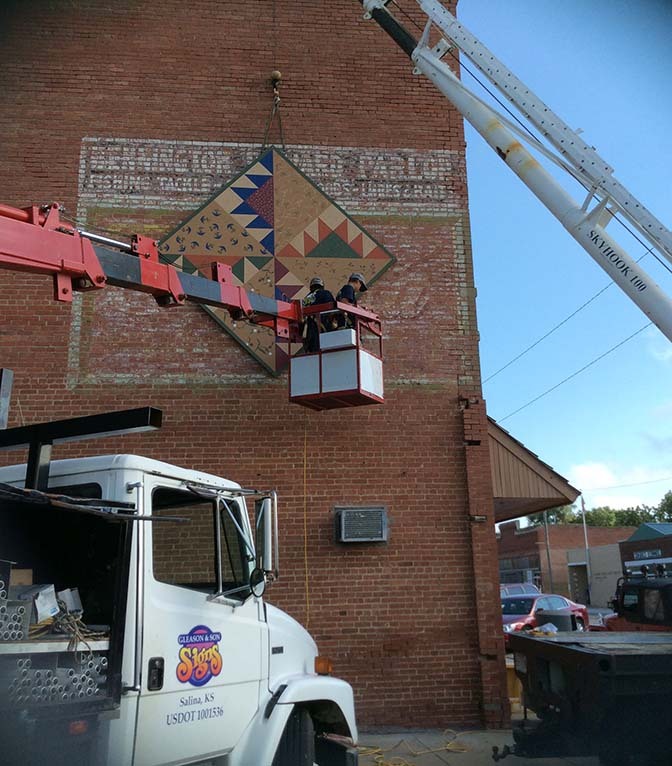 There was quite a commotion in downtown Bennington last week as Gleason's Sign Co. came with two bucket trucks and a three-man crew to hang my Barn Quilt on the side of the KT Quilt Shop. 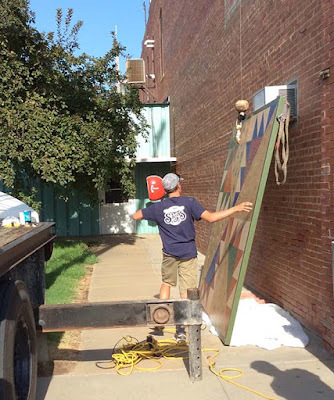 Sue Hageman of Manhattan, KS did a wonderful job painting the 8-foot square Kansas Troubles block. She used classic KT colors and free-hand painted enlarged images of my fabric in each block. Fantastic! Thanks so much, Sue. It is better than I imagined! Josh and his crew evaluate how to proceed. The guys had to prep the barn quilt by drilling 8 holes in the outer perimeter for bolts. At more than a hundred pounds, it needed to be firmly attached to the brick so the wind couldn't budge it. 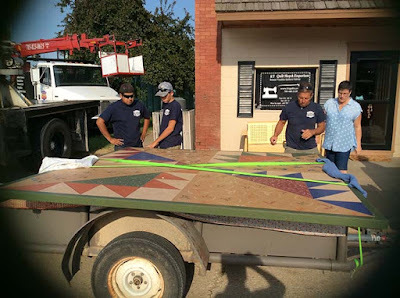 Getting ready to lift the barn quilt. For years, there's been a Coca-Cola sign painted on the side of our building advertising the previous owner - Bennington Billard Parlor - Fishing Tackle, Lures & Bait. 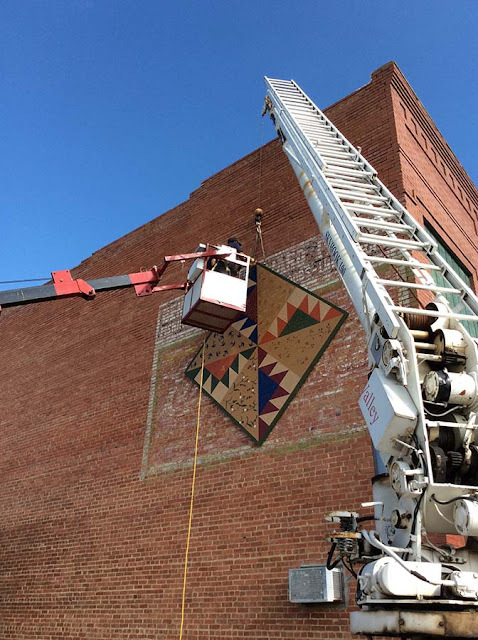 We've looked into having it repainted, but there are only a handful of authorized Coke mural painters and I really preferred a Barn Quilt. One truck hoisted the barn quilt as the other truck lifted the bucket with the crew in it, ready to straighten and attach the sign to the side of the brick building with huge lag bolts. The crew congratulating themselves on a job well done. Our KT Barn Quilt will greet you as you drive into our little town of Bennington. There will be no doubt where the KT Quilt Shop lives. Comment this week to win a Sunflower Song charm & mini charm. It's a great start to the Sunny Trio charm project. You're the winner of the new I Love 9-Patches book by Martingale. We'll send your copy as soon as we receive our shipment. Enjoy! I'd love to see what you make from the book. You've heard of the Dogs Days of Summer? Well, I schedule Gramma Days of Summer, booking time with the grankids. I'm a bit late posting this week because I was up to my neck in water - literally. Aleece (12), Rowan (13) and I spent a couple days at Great Wolf Lodge Waterpark in Kansas City to celebrate birthdays and generally hang out. We shopped for school clothes, supplies and assorted needful things. This is pretty much how we all felt after swimming, playing shopping and staying up late watching movies. 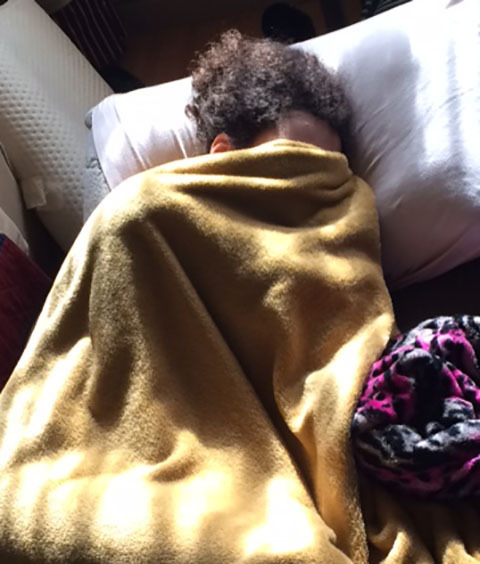 Aleece needed some extra sleep this morning. 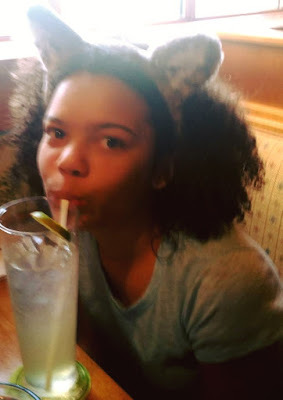 To be fair, here's Aleece with her Great Wolf Lodge ears enjoying her birthday dinner at Olive Garden. 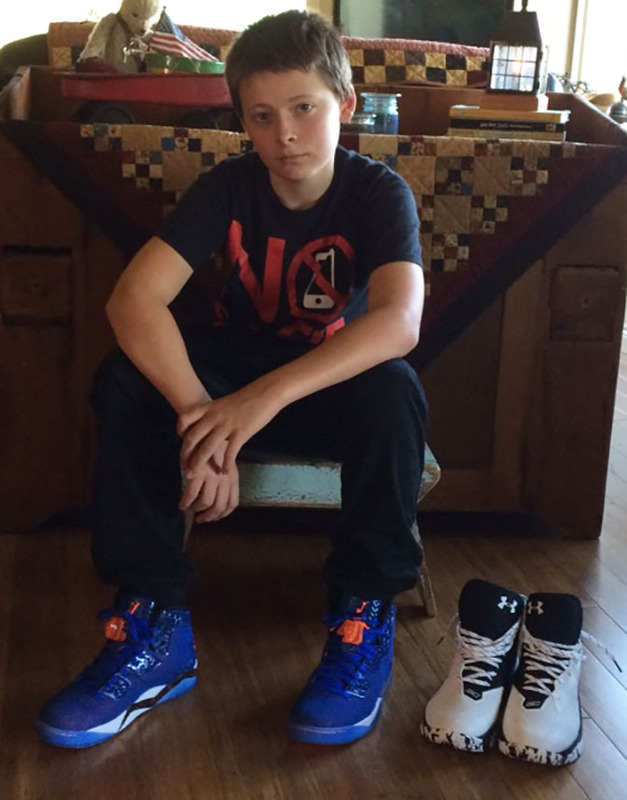 Rowan with his cool Jordan's and Curry's. All set for the first day of school. Throughout the week, Cooper (15) and Delainey (10) will be coming and going and I'll swap out the girls for the boys and vice versa. In between swimming, gaming and visiting our local eateries, the kids volunteer to help out at the store - stuffing patterns for Jamie, carrying boxes up and down our 26 steps and folding fat quarters to earn a few extra $$$. There's always something new added to their wish lists. Each week this month, we'll be offering special pricing on our Sunflower Song patterns, fabric and precuts. 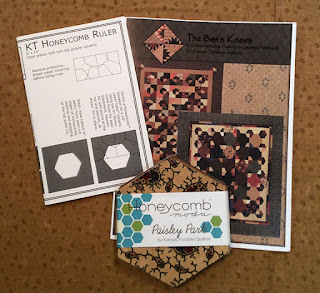 This week, the Sunflower Song pattern with queen, lap, runner and pillow projects is on sale for $8.95. The Sunny Trio charm pattern is on sale for $4. Check back next week for more specials. Our ktquilts.com website is in major transition this week, so please be patient with us as we upgrade and update all the pictures and links. If you have any issues, please call Jamie to order at 785-488-2120. Comment to win one of each of the Sunflower Song and Sunny Trio patterns. We'll have more Sunflower Song good stuff in the coming weeks. Happy last weeks of summer!